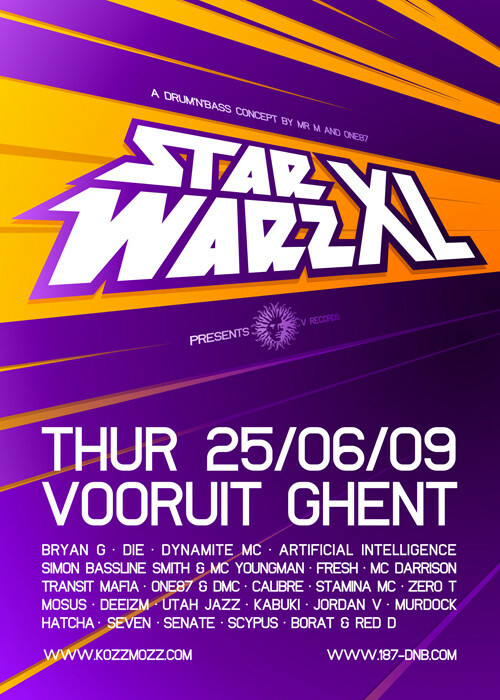 Star Warz has built such a great reputation over the years that agencies and labels love to present their artists on this leading Drum ‘n’ Bass event from Ghent. After label nights from 31 Records, ESP Agency and Critical, this time Star Warz welcomes V Records and their sub-label Liquid V.
V Records has been pioneering Drum ’n’ Bass since Bryan Gee discovered a young Roni Size and started the label as a platform for this new talent. It is one of the longest-running Drum ‘n’ Bass imprints, with a large catalogue of releases stretching back to 1933. V Records is know for representing a wide variety of styles and subgenres of Drum ‘n’ Bass, from liquid styles to harder sounds. Its sister label Liquid V has provided an outlet for the smoother, more soulful side of the sound. We are proud to welcome, Bryan Gee and his label mates to our next XL edition of Star Warz. Bryan Gee is the founder of one of the most respected Drum ‘n’ Bass labels, V Records. He helped dj’s like Ed Rush, Optical and Dillinja while they were working their way to the top. He also took command of the airwaves with one of the biggest shows on Ministry of Sound radio, attracting a worldwide audience. He will play alongside Fresh who was voted best producer in the world several times and that’s how he gained his nickname Uberproducer. He began his career as front man of Bad Company. Now he runs his own label Breakbeat Koas on which he released his solo album ’Escape from Planet monday’. Several music magazines describe this album as a triumph. And if that is not enough we also welcome Simon Bassline Smith who has been on the forefront of the Drum ‘n’ Bass industry for more than two decades. With his successful label, Technique Recordings, he has released over 40 quality dance-floor killers for instance the all-time classic ‘Odyssey’. He also runs his famous nightclub, Interface. There is no doubt … this man is multi-talented! Together with his MC Youngman, who was voted runner up for Best Breakthrough MC in the Drum ‘n’ Bass Awards, he will bring us an unforgettable performance. To fulfill the line-up in the main room the duo Artificial Intelligence will perform next to dj Die who had several joint-ventures with Drum ‘n’ Bass heroes like Roni Size and Dj Krust. To end this magnificent night resident One87 and MC Dapper will rock the V Records Room. For our second room aka The Liquid Room we have invited some Very Important People such as Calibre, who’s going strong with his own imprint, Signature Recordings. Also Utah Jazz who became famous after his debut album ‘It’s a Jazz Thing’ will be representing the Liquid sound. The global impact of his album has made Utah Jazz one of the most in demand selectors on the international Drum ‘n’ Bass circuit. And then we have Zero T. For those who don’t know, Zero Tolerance is one of the biggest names in liquid Drum ‘n Bass at the moment. He has releases on V Records imprint and has just released his new album "Cheap Shots" on CIA Records. They will be joined by the German Kabuki, Jordan V - the son of legend Bryan Gee -, Mosus who has teamed up with the founder of V Records and our own Belgian Murdock. This Liquid Room will be hosted by female MC Deeizm and MC Stamina. The third room will be full on Dubstep with Hatcha who has his own programme on Kiss FM. Furthermore we have the young talented Scypus from Antwerp who will be accompanied by Senate and Seven. No boundaries in the Café, where DJ Borat & Red D take you on a custom made musical journey, all night long. Set all phasers on stun, Star Warz XL strikes back in full force!